Even if one is hundred of times immersed in her. Even if reciting hundreds of precepts. Is when I erase ego from my heart. 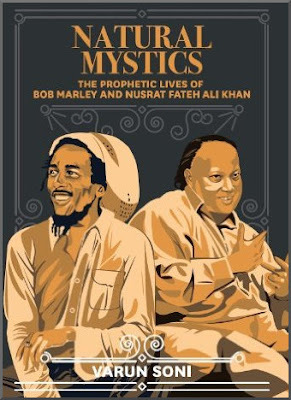 Nusrat Fateh Ali Khan declaimed that lyric*, and Varun Soni's Natural Mystics: The Prophetic Lives of Bob Marley and Nusrat Fateh Ali Khan is an expanded doctoral dissertation that studies the two great musicians as prophetic mediators of religion, politics and popular culture. The importance of erasing ego from the heart is a message that is resolutely ignored by Western classical music. But there is much else in Varun Soni's thesis that classical music should take to heart, not least his assertion that music is a prophetic tradition. He then proposes that prophetic traditions rely upon technology to disseminate their messages, and that with new media comes new prophetic channels. Western classical music is proud of using new media - MP3, streaming etc - to disseminate its message, but the message itself remains firmly defined by 19th century conventions. Technology, demographics and lifestyles are creating new prophetic channels. But classical music uses new technologies to do no more than maintain the status quo; not just in performance traditions, but also in its ego-ridden and corporate-driven business model. Which means the digital revolution is set to become become yet another missed opportunity for classical music. In the spirit of challenging the status quo I conclude with a link to my 2013 post Why louder classical music is better classical music. * Lyric comes from Ni Main Jana Jogi De Naal by the 16th century Punjabi poet Bulleh Shah. No review samples used in this post, but thanks go to JMW for acting as my shipping agent. Any copyrighted material is included as "fair use" for critical analysis only, and will be removed at the request of copyright owner(s). Also on Facebook and Twitter. Thank you so much for mentioning Bulleh, pli.